Just in case that you haven't come across this short article, W4UCH/2, using a TRS-80 Model 1, has created a software 8273. 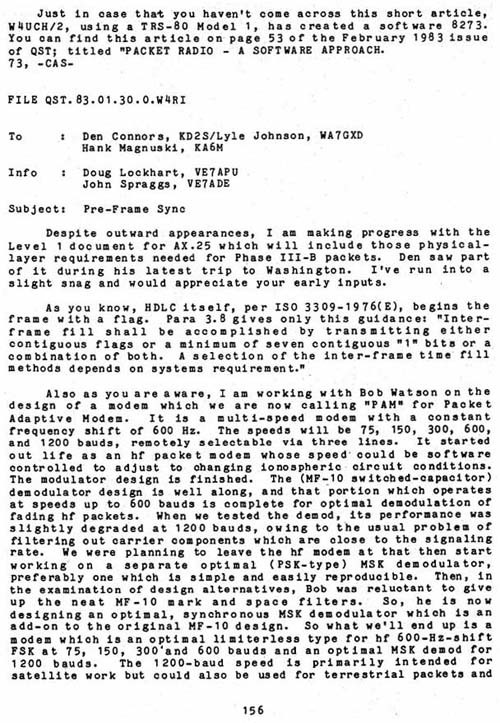 You can find this article on page 53 of the February 1983 issue of QST; titled "PACKET RADIO - A SOFTWARE APPROACH. Despite outward appearances, I am making progress with the Level 1 document for AX.25 which will include those physical-layer requirements needed for Phase III-B packets. Den saw part of it during his latest trip to Washington. I've run into a slight snag and would appreciate your early inputs. As you know, HDLC itself, per ISO 3309-1976(E), begins the frame with a flag. Para 3.8 gives only this guidance: "Interframe fill shall be accomplished by transmitting either contiguous flags or a minimum of seven contiguous "1" bits or a combination of both. A selection of the inter-frame time fill methods depends on systems requirement."